A Hindoo Place Of Worship. bl.uk > Online Gallery Home	> Online exhibitions	> Asia, Pacific and Africa Collections	> A Hindoo Place Of Worship. Plate fourteen from '24 Views in Indostan by William Orme'. This engraving by Joseph C. Stadler (fl 1790-1815) is based on an original by Thomas Daniell (1749-1840). 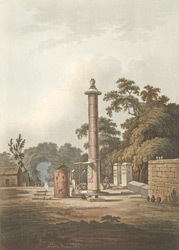 The location of the scene is not identified, but it appears to show a Brahmin standing by a pillar. The pillar is decorated with a small canopy and some garlands made of white blossoms.